If you want to use multiple accounts in Outlook and one is an Exchange server, the Exchange account always wants to be the default data file. While you can set any email account as the default account for sending mail, you may not be able to set the data file as default in the Account Settings dialog. While this was fixed in Outlook 2016, if you use an older build (such as is available with the retail version), you will need to use the following steps to change the default if you have a business Microsoft Exchange account. The selected Outlook data file (.pst) format cannot be used. Outlook data files (.pst) must use the same format as offline Outlook data files (.ost). Select a matching Outlook data file (.pst) or turn off cache mode in the Account Settings. However, you can set another data file as default if you add the Exchange account to the profile from the Control Panel's Mail applet and follow specific steps. If the Exchange account was the first account added to the current profile, you'll need to make a new profile. Note: It doesn't matter which account is added to the profile first but you absolutely must add the Exchange or Outlook.com account to the profile from Control Panel and disable cached mode (Step 2) on the account before closing the dialogs. If using a Google Apps account, let Google Apps create the profile and open Outlook (at least) once to sync the account. Close Outlook and add the Exchange or Outlook.com account to your profile from the Control Panel. If your profile opens directly when you click the Outlook icon, click Email Accounts. If you are creating a new profile, or have more than one profile, click Show Profiles then add a new profile or select the correct profile. Add the Exchange (or Outlook.com) account to the profile. Click the Change Account Settings box (Manually Configure settings in older versions) after your account is configured and then click the Next button. Uncheck the Use Cached mode option to disable cached mode. 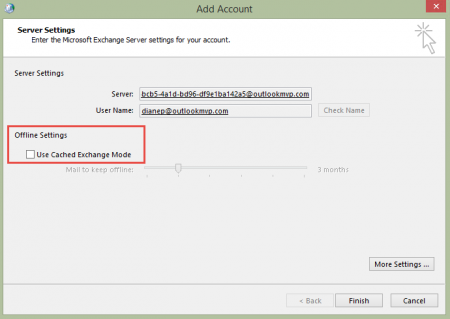 If the Use Cached Exchange mode is grayed out, click More Settings, then Advanced and untick Use Cached Exchange Mode. Click Data Files and set the desired data file as the default. 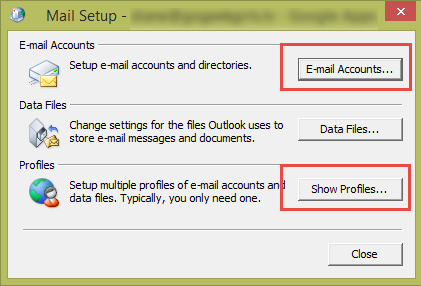 Close the Account Settings dialog to return to Mail setup dialog (screenshot in Step 2) then click Data Files button to re-open Account Settings dialog. Verify the default data file is correct. If you get the message that you can't set the other data file as default, double-click on the Exchange data file and untick Use Cached Exchange on the Advanced tab again. From Email tab, double click on the Exchange account and re-enable cached mode. Close the dialogs and return to the Mail applet. Reopen the profile and verify the correct account and data file is set as default. If you created a new profile, set it as the default profile. "The set of folders cannot be opened. The Outlook data file whatever.ost cannot be used in this profile. Outlook currently delivers items into an Outlook 97-2002 data file, which does not support multilingual Unicode data. To correct this, change the delivery location to one that supports multilingual Unicode data." This is incredibly frustrating, because it had been working like a charm before. What is happening now? What is set as the default data file? That message indicates its an old pst format. Did you try creating a new profile? Yep, that was the issue. Somehow, on the Outlook rebuild an old PST started the process. Made a new profile with a clean, new PST and everything is good again. Thanks. I am looking to see if there is a way to set the default data file from .PST to .OST via a registry key or a power shell script. We migrated from POP3 and we have end users where their old .PST file became default to their new Cloud account. See Picture - Need to set .OST to default via registry key / power shell script. AFAIK, you'd need to use extended mapi or redemption to change it. i don;'t think you can do it using powershell. Because the profiles are not all identical, you can't make a simple reg key change and pass it out in a logon script. As an FYI, even though 2013 and 2016 can set the imap data file as default, but its not recommended because of the 'this computer only' folders that are not synced with anything, which could lead to data loss. I'll need to test it when I get back from vacation, but another user was told by both ms and Google it wasn't possible. She only needed email from Google, so we removed the sync utility and added Google as an imap account. If you need Google calendar and contacts and only email in outlook.com/exchange, they could be added as imap accounts. I've given up on this for now. Neither Google nor MS seem to be willing to solve this issue. Both expect you to switch to them exclusively or use IMAP. Do you happen to know what the difference between Exchange Server and Outlook.com account types is when adding a new email account on an iPhone? As far as I can gather, both are EAS...? They should be the same and it should be EWS (Exchange web services) as they are on the same server - if Notes sync, its EWS. Older phone os's or older 3rd party mail clients might use EAS - if no Notes its EAS. You can use either Exchange or Outlook.com option - they give both to make it easier for users. Something weird must be happening on the backend side then. I use a custom domain on Premium Outlook and 2 different mailboxes used to work in iOS stock mail app until yesterday. One of the boxes asks for the password constantly and refuses it even though it's the correct one (verified in Outlook and different browsers in OWA). The 2nd mailbox on the same domain works just fine. Both were added through the Exchange option in iOS. I removed the one not working and tried adding it again through the Exchange option. Wont work, keeps trying to verify but throws a can't verify exchange server error. Just for fun I tried adding the mailbox through Outlook.com option and it worked right away. Now I have one mailbox added through the Exchange option where I can see the eas.outlook.com server option in the settings and the one refusing the correct password added through the Outlook.com option where I cant see any of the server settings in the settings app. Just seems strange this way. I have had issues off and on with my business accounts for the past week, often putting my password in several times before i closing the password dialog in frustration and the accounts works. I've used your work for years, so thank you for all of the past help! This solution is not working for me at present. I am using Outlook 2016 (Office 365 Home) on Windows 10. When I reached your step 5, after going into Advanced and removing the "Use Cached Exchange Mode" when I clicked accept, it told me that I needed to restart outlook (though Outlook was not, to me running) and then when I went back "up the chain" to the screen that looks like yours in step 5, the Use Cached Exchange Mode was still grayed out. I then exited the mail applet and tried to open outlook. It would not let me--it just got hung up. Does what I share here help you help me? I use Gsuite and GSSMO for work and an outlook.com account for personal matters. I'd like my default desktop Outlook 2016 calendar to be from work, but want to keep my separate outlook.com calendar. Make sense? You're using the sync utility from google? That could be throwing a wrench into it - i didn't test the steps with that scenario. The restart message indicates that the change 'worked'. 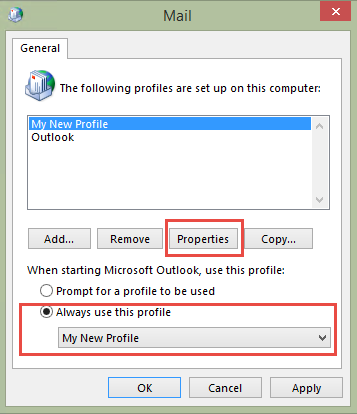 After you get that message and the one about changing the default for calendar/contacts, close the account dialog and go back to the profile screen (the one in step 2) then open the profile again, go back into the outlook account and set it to use cached mode - before opening outlook. Thank you for the assistance! I've worked it all through, but it continues to get hung up and not work. I think the gssmo is the issue. I'll return to my former approach--not ideal but works well enough. Thank you Diane for this very useful post, however I am using Outlook 2016 on Windows 10 which is causing headaches. I am still having the same issue faced in this article however I cannot select a different default data file selected what ever I try! Obviously the control panel/account setup is very different in Windows 10 and although I followed the process and set it up as close as I could it doesn't even appear in Outlook. Any chance you could shed some light on this by chance? No error messages unfortunately. When I add the account in the mail app under control panel (Email, calendar and contacts under Email & app accounts) the account is authenticated and appears in control panel however I launch Outlook and it is not in there at all. But if I try to change the default data file within Outlook I just get the Mail Delivery Location error as above in your post. After adding the account, go back to the main Mail screen where it either shows your profile or has the dialog shown in the screenshot in step 2 - is the account there? What account types are in your profile? I found a workaround to this - simply set up Hotmail in Outlook 2016 as an IMAP account. I followed the Outlook 2003 instructions here on Slipstick https://www.slipstick.com/outlook/config/configuring-outlook-com-in-outlook/ and it worked fine. This solution is not working for me. I have an IMAP account that I want to be my primary account, with Hotmail as a 2nd account (using build 1611 of Outlook 2016/365 account). I stopped getting emails in my Hotmail inbox, except a notice telling me I had to reconnect my Outlook 2016 to outlook.com. The only way to get email is to delete hotmail account and re-add through default settings - which hotmail.ost is the default data file and eas settings are greyed out. The result of this is that hotmail calendar is the default and anytime I go to calendar in Outlook that calendar shows up first. The calendar tied to my IMAP account is the one where I manage my schedule. Any suggestions? You need to have the outlook.com account configured in outlook as either IMAP or POP3 if you aren't using the calendar & contacts -this downloads only mail. However, I would not use the IMAP folders labeled 'this computer only' to store calendar and contacts - if you aren't going to use outlook.com's folders, then use a local pst. If anything happens to the imap data file the contents of the 'this computer only' folders will be lost.